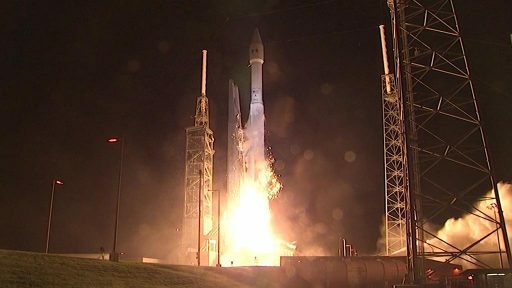 A United Launch Alliance Atlas V 421 rocket made a pre-sunrise blastoff from Space Launch Complex 41, Cape Canaveral on Friday, embarking on a long flight to deliver the Morelos 3 satellite to Geostationary Transfer Orbit for Mexico. Liftoff came at 10:28 UTC after a last-minute hold-up by a boat that had entered the launch hazard area. 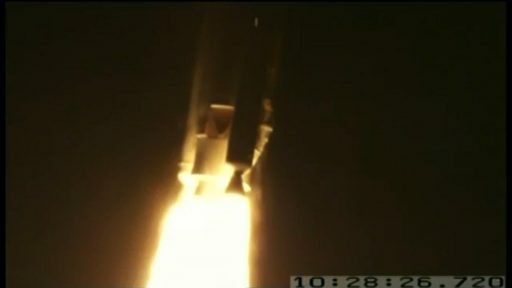 Atlas V completed the early events of its ascent in textbook fashion, arriving in a Parking Orbit for a long coast for a short, but critical burn ahead of spacecraft separation at 13:19 UTC. Atlas V, set for ULA’s 100th mission, was rolled to the launch pad at 21 UTC on Thursday, becoming the first to re-inaugurate shortened on-pad campaigns that had been part of Atlas V’s portfolio in the early years of the program and have been re-discovered by ULA to reduce the time spent on the pad by the rocket. Arriving at the launch pad, Atlas V was connected to ground systems and close outs were started by teams who were busy working at the pad until around three and a half hours ahead of launch. 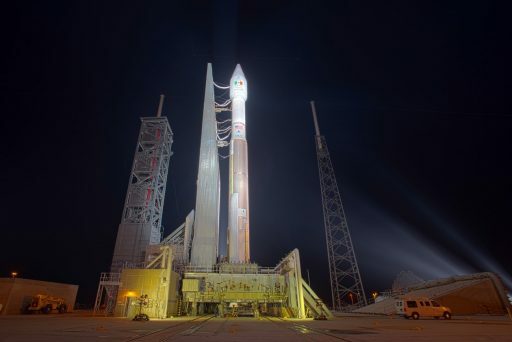 Countdown operations formally picked up seven hours and 20 minutes ahead of the opening of the day’s launch window when the launch team reported to console and Atlas V was activated to undergo an extensive set of tests taking until L-4 hours. All tests were satisfactory, allowing teams to press into the setup for tanking. Propellant loading started when the countdown resumed from the T-2-hour hold and Atlas V was filled with 284 metric tons of Kerosene and Liquid Oxygen on the Common Core Booster and LOX and Liquid Hydrogen on Centaur. Fueling was by the book and teams entered the final critical reconfigurations of the rocket and the satellite which switched to internal power to be ready for liftoff. When all Stations gave their final GO Atlas V was able to head into the automated sequence of the countdown four minutes prior to liftoff. The rocket pressurized all tanks, switched to internal power and initiated its onboard sequencer, getting ready to ignite its engine. 51 seconds before the planned 10:08 UTC liftoff, a hold was called in the Countdown when range controllers took note of a boat that had entered the falling debris zone. Atlas V was recycled to a safe T-4-minute configuration while the boat was contacted to leave the launch hazard zone that had been posted days in advance to notify all marine and aerial traffic of ongoing launch activities. Luckily, the boat was quick to move out of the area and the weather held up, allowing the countdown to re-start – this time without further incidents. At 10:28:00 UTC, Atlas V ignited its twin Solid Rocket Boosters and jumped off its pad, embarking on a rare commercial mission. The 58-meter tall rocket balanced vertically for six seconds with a total thrust of 734,700 Kilogram-force. Pitching and rolling onto a precisely calculated course, the Atlas V swung to the south-east, departing the Space Coast on a 104-degree launch azimuth to fly towards the sunrise. The vehicle broke the sound barrier 46 seconds after launch and encountered Maximum Dynamic Pressure when passing the T+1-minute mark. The twin boosters, each burning 41,000 Kilograms of propellants, burned out one minute and 34 seconds after launch and were jettisoned 33 seconds later to ensure they harmlessly fell into the ocean. 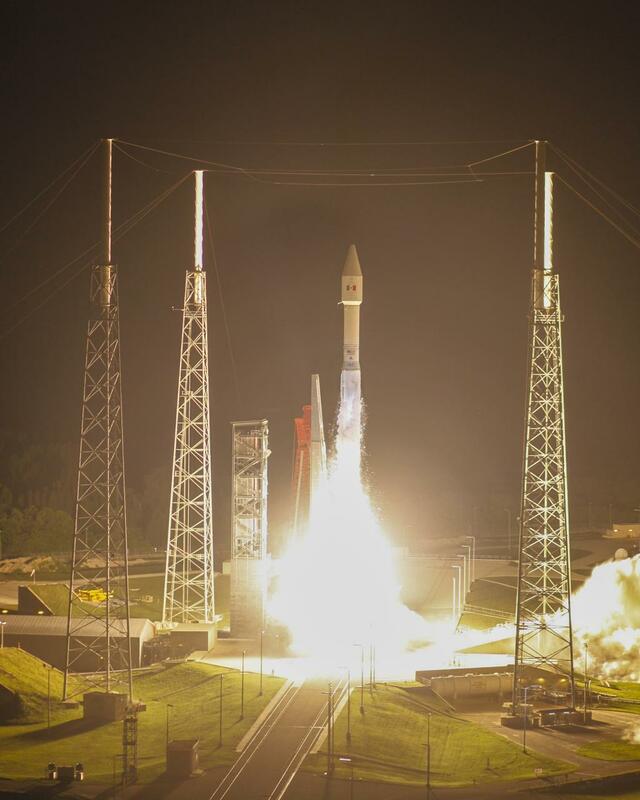 Relying on its RD-180 engine alone from that point on, Atlas V headed uphill with a thrust of 422,400 Kilogram-force. 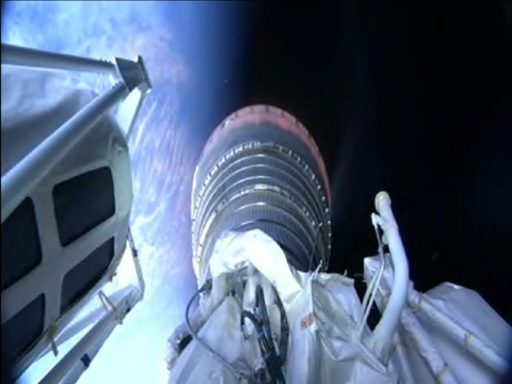 Shutdown of the first stage occurred four minutes and nine seconds after liftoff followed six seconds later by the pyrotechnic separation of the Common Core Booster that then used eight retrorockets to pull away from the Centaur upper stage. Centaur purged its reaction control system and pre-started its engine. Engine start on Centaur was confirmed four minutes and 25 seconds after launch as RL-10C soared up to 10,800 Kilogram-force of thrust. Less than ten seconds after Centaur ignition, Morelos 3 was greeted by the sunrise as the two fairing halves were separated and made a clean departure of the vehicle. Centaur fired its engine for close to 14 minutes, achieving the planned transfer orbit measured by the vehicle’s navigation platform as 181.5 by 31,725 Kilometers at an inclination of 29.97 degrees. In this orbit, the vehicle will coast, progressing from a position over the Atlantic Ocean to a pass over the southern nations of Africa and heading out south of the island of Madagascar for a long pass over the Indian Ocean. The 2.5-hour coast phase will allow the vehicle to gain altitude so that the second Centaur burn can be performed at a position closer to the apogee of the orbit, thus raising both, apogee and perigee. The second Centaur burn is expected to begin two hours and 48 minutes after liftoff and last for 51 seconds, aiming for an orbit of 4,738 by 35,786 Kilometers inclined 27.0 degrees. Being lofted to its targeted Geostationary Transfer Orbit, Morelos 3 will separate from the Centaur upper stage at T+2 hours, 51 minutes and 50 seconds, 13:19 UTC. Confirmation of mission success will be provided by United Launch Alliance after a nominal spacecraft separation can be confirmed.